The Flagg Creek Heritage Society (FCHS) in conjunction with the Philip H. Sheridan Camp # 2, Illinois Sons of Union Veterans of the Civil War (SUVCW), and the Lyonsville Cemetery Association held a Civil War Commemoration on September 8, 2012, at the Lyonsville Cemetery, Indian Head Park, Illinois to honor the Civil War veterans buried in the cemetery. It was a picture-perfect fall day, and the cemetery’s lovely grounds added to the service. Lyonsville Cemetery was organized in 1848, and includes the graves of 15 Civil War veterans and two unknown Civil War soldiers who most likely died on their way home from the war. Edmund Polk, a veteran of the War of 1812, is also buried in the cemetery. Steven J. Westlake, Past Department Commander of the Illinois SUVCW welcomed the audience seated outside on the cemetery grounds. The 10th Illinois Volunteer Infantry, The Rockford Zouaves, and Burr Ridge Boy Scout Troop #69 posted the colors. Jerome Kowalski, National Chaplain of the SUVCW preformed the invocation. Mr. Westlake and Indian Head Park Mayor Richard Andrews also provided introductory remarks. The Lyonsville Congregational United Church of Christ choir provided a choral interlude which was followed by a historical perspective on the Civil War. Mr. Max Daniels portrayed President Lincoln and recited parts of the poem Bivouac to the Dead. FCHS Board Director Mrs. Hazel Sharp referenced the collection of Civil War letters from Captain Hiram McClintock that FCHS has in its archives. She also related the important role that the Lyonsville Congregational United Church of Christ played in the Civil War. Seventy-two men were mustered in from the church. Local soldiers on leave from the Illinois 127th Regiment would place the muster roll on the communion table and ask for recruits to fill the ranks of those who were injured or died. For more information on the Illinois 127th read Roger Boedecker’s Civil War Service of the 127th Illinois Volunteer Regiment. One of the SUVCW’s main projects is to obtain federal funds to replace worn headstones of Civil War veterans. Stephen J. Westlake and David C. Bailey, local members of the Illinois SUVCW, spearheaded the project to replace headstones for 11 of the 15 Civil War veterans buried in Lyonsville. David C. Bailey, Sr., Past Department Commander researched the service records and pensions files of the Civil War soldiers honored with new gravestones. His research will be available at the FCHS museum. As Mr. Bailey read the soldier’s biography, a SUVCW member placed a red rose and a sprig of green on the grave. 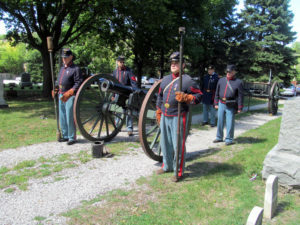 Mulligan’s Battery, Illinois SUVCW provided an artillery salute with a Civil War era cannon. The sound of the cannon was deafening and the acrid smell lingered in the air—giving the audience a sense of the horror the soldiers experienced on the battlefield. The choir led the audience in singing the Battle Hymn of the Republic, which was followed by a rifle salute and the playing of taps. National Chaplain Jerome Kowalski offered the benediction. The Commemoration ended with the retiring of colors, and left those in attendance with an appreciation of the young men who fought and died for the Union. View the Lyonsville Cemetery Civil War Commemoration set on Flickr for more photos.